This dress is the dress that I have unknowingly been waiting for forever... 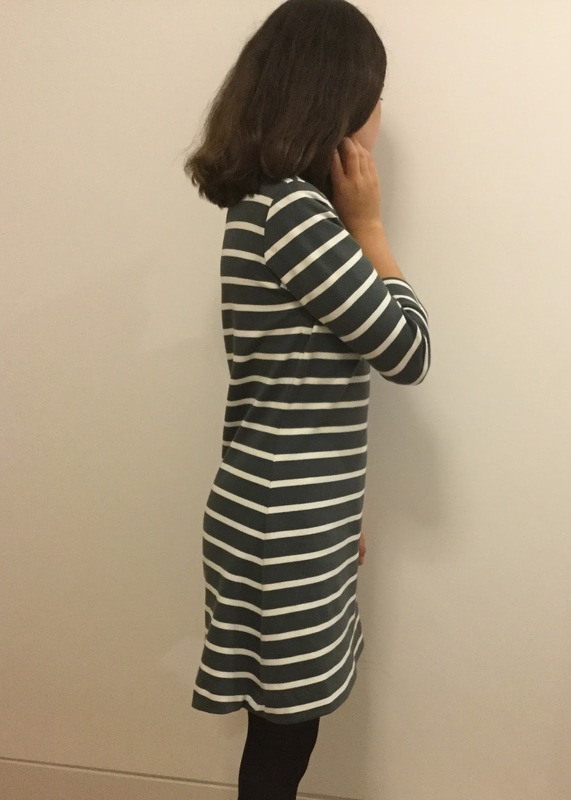 It's a stripy Tilly and the Buttons Coco dress and I love it! 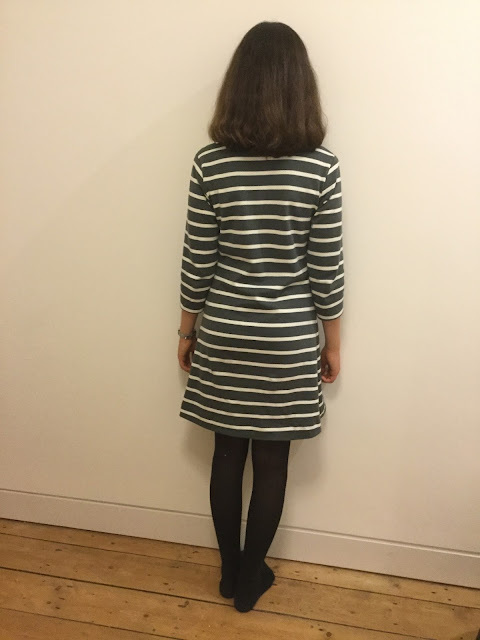 It's one of those garments that I never knew I needed, and then once made I've worn it constantly (or as constantly as a five-days-a-week compulsory school uniform allows stripy dresses to be worn!). The Coco sewing pattern is definitely one of my most used patterns, although this is the first time I've made the dress version. 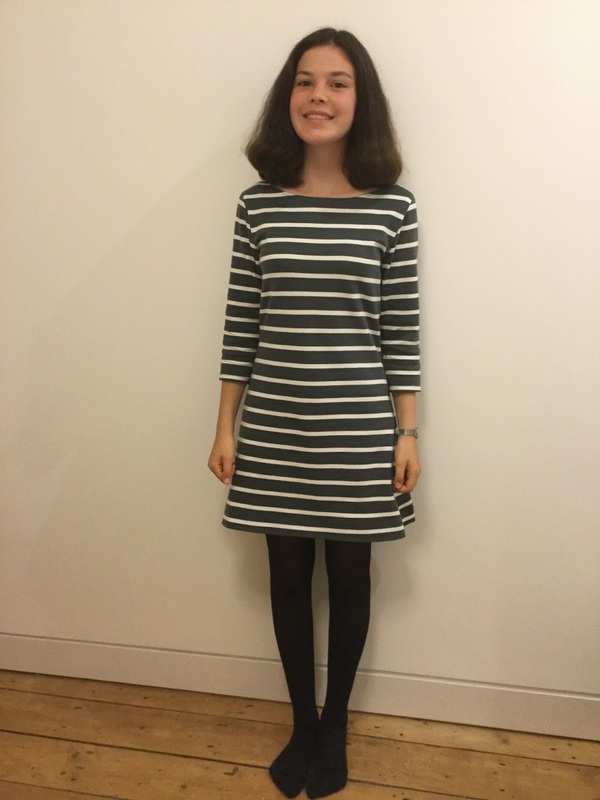 This dress is probably most similar to my stripy Coco top, which I've worn a lot too. 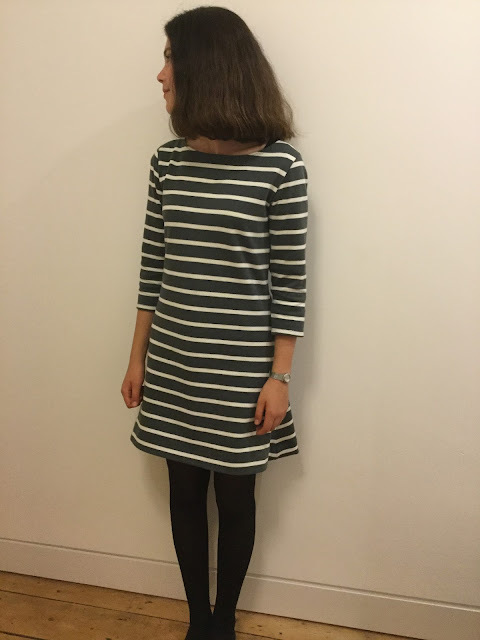 The fabric is from Stoff and Stil, I mentioned it in this post. I think that it is seriously one of the most incredible knit fabrics that I've ever seen/felt/sewn with. It's so soft, thick enough for autumn/winter, but not too thick, the perfect colour, the most wonderful stripes... and the list goes on! I have a little bit of a love/hate relationship with dresses, in that I adore them, yet rarely get a lot of wear out of them. This is why more casual dresses, such as this one and my Rosa shirtdress, are perfect for me. One of the many things that I love about this dress is that it's perfect for autumn (yes, I've finally admitted that it's autumn!) when worn with tights, and it will hopefully also work really well in the winter, spring and maybe even the summer depending on how much layering is added. I'm really pleased with the pattern matching on this. For me, stripes have to be pattern matched. I love the professional look it gives off, and I don't mind taking the extra time when cutting to ensure that the stripes will match perfectly. However, I've never actually pattern matched with anything other than stripes, so before I declare my love of pattern matching I should probably try some more complicated prints! In case you haven't guessed by now, this dress is a complete winner. The pattern, as always, was really easy to sew up, and I like to be able to have patterns that I'm so familiar with they feel like old friends! All I can say is that I'm clearly going to have to make more... So many different versions are already coming up in my head! Beautiful dress and you have done a fantastic job matching those stripes. I am so impressed with your sewing and your blog! You write and sew very well. Your blog went up on the "Sew Much Fashion" blog list, so I expect your traffic is going to increase quite a bit. I hope I get to enjoy reading about what you sew for a long time. You did an amazing job matching the stripes. It really gives it a professional look. You look great in your dress. This turned out SO cute! And you're right, stripe matching makes all the difference. Beautiful work! This is a great dress and is sure to be a wardrobe workhorse! It also reminds me that I need to make another Coco... what a useful pattern. Such a lovely dress! I am not surprised you love it.